Justin is a first year Laws and Commerce student Monash University. The intrinsic link between human psychology, economic trends and its impact on society is what interests Justin most about the field of economics. As a law student he is also intrigued by economic policy and how politicians shape the everyday lives of our citizens. Justin was drawn into ESSA due its friendly and highly inclusive culture, its focus on productivity and career development as well as the abundant surplus of pizza supplied by sponsors. 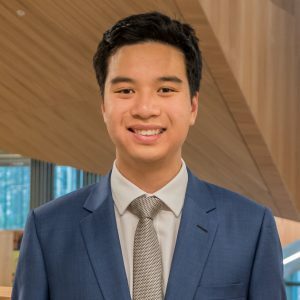 As a subcommittee member he aims to maximise the marginal benefit of all ESSA’s diverse portfolios while gaining valuable experience to guide and lead ESSA in the future. Outside of the classroom, Justin can be found playing-off other committee members in tennis to determine future positions, taking over-excessive amounts of photos of his pet cat, or just scouring Melbourne for the finest burger joint in town. Also, Justin’s passion for driving has assumed him the role of resident chauffeur.